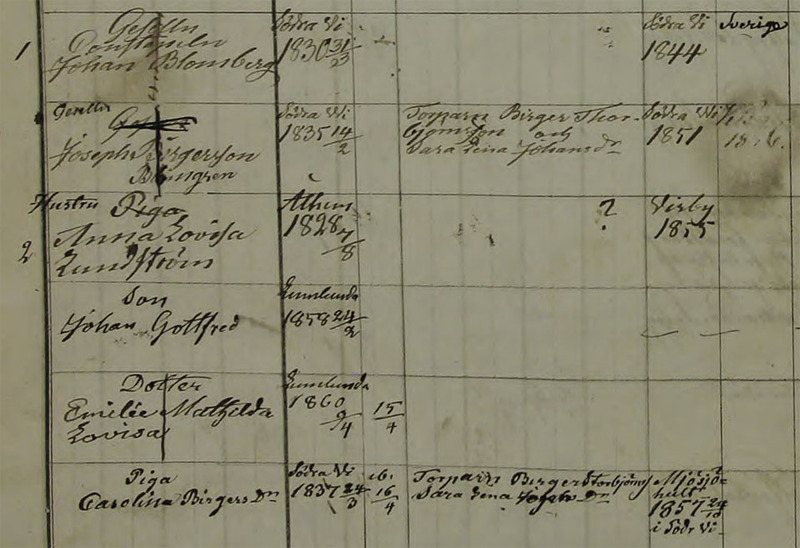 For years my family has been stuck finding the parents of Josef Blomgren (no middle name) born 14 February 1835 in Södra Vi (according to the church records in Kristdala). I recently got access to the Riksarkiv (http://riksarkivet.se/) and opened the archive for births in Södra Vi on February 1835. There was one Joseph born on that date, son of crofter (torpare) Birger Thorbjörnsson and his wife Sara Lena Johansdotter. The first name and birth date are such close matches that I'd like to believe that this is the ancestor who changed his name to Blomgren. How can I prove this? When people changed their names from a patronym to a fixed surname, was there any documentation? You haven't in your posting, provided in which record of Kristdala you did find the note concerning Josefs birth. of Södra Vi down to his birth. There might be a note, but often a change just occurs, without further explanation. This Josef Blomgren dies in Gråmanstorp, Kristianstads län, Skåne, Sweden in 30 Nov 1922 as a widower since 8 July 1894. If this is Your Josef then backtrack him from here, to see when he took the name Blomgren, maybe it was when ho came to Blomsholmen, or? There was no special documentation at this time when people changed their name. You just told the priest that from now on my name is NN, and the priest wrote it into the church book. Josef was a rather uncommon name and the birth date is the same through the books, so this must be the right person. It was very common that you took a new name when you became an apprentice, took on a profession, moved to a city, married and similar occasions. He probably takes his new name when he becomes a paper maker apprentice and started to move around to several paper factories/mills. I have followed him backwards in almost all books. (The picture numbers are from ArkivDigital). Lummelunda AI:4 (1856-1861) Bild 500 / sid 79 Here he takes on the name Blomgren. In Lummelunda AI:3 there is a Johan Birgersson changing his name to Blomberg, thus he took that name before 1855. In Lummelunda AI:4 he is on the row just before Joseph Birgersson Blomgren, a brother? I saw him too and yes, Johan (Johannes in Södra Vi) it is a brother. There were many siblings. Oh my goodness! I keep having to pick my jaw up off the floor because I am so impressed! Thank you all for the information. Thank you, Håkan, Kristina, and Leif, for doing all this research. I had no idea that ArkivDigital existed! I'm practically jumping for joy! 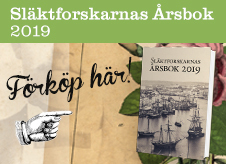 I've been waiting for this information since I first tracked down Josef Blomgren in 1979 in a Kristdala kyrkobok and the pastor told me I would have to go to Stockholm to find the older books. Thank God for the Internet. TACK SÅ MYCKET! And thanks for educating me, Olle, and everyone. I found the information in digital form on Ancestry.com in Volume Number: AI:29; Page Number: 231, one of the pages that Kristina checked. Thanks for introducing me to the lingo! How efficient. In Södra Vi AI:13 it says Joseph moves to Gotland (the big island in the Baltic sea), but no place mentioned. In Hjorted BI:2 (moving in), p 71, left side number 4 from the top) it says he comes from Rummelunda. I guessed that would be Lummelunda, found out there was a paper mill and there he was, at Överstekvarn. There are no moving in or out records for Lummelunda for this period. As it seems to be clear that Josef was the son of Birger Torbjörnsson in Södra Vi parish, you might want to look for his ancestors. There are several discussions (in Swedish, but you can maybe use Google translate). It seems Birger was born in Kisa parish in 1785 and his ancestors are to be found there. The line goes back to the captain Torbjörn Svensson in Mistefall, Kisa (E), who fell in battle in in 1669. PS. Adding to the mail by Kristina about Arkiv Digital. I do not know about the riksarkivet (SVAR) pictures, but a big advantage with the newer photographs is that the household examination records (husförhörslängd) were indexed sometimes in the 1970-ties. 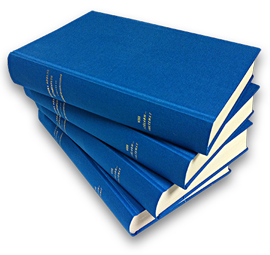 This means that you can more or less directly find a place in the records at Arkiv Digital. I spent hours trying to find a specific page in Genline (now Ancestry) in the old photographs. Thank you so much again. Karl-Henrik, I saw the page about Birger Torbjörnsson and I was excited to see it. Thank you for all the other links as well. Nu kan jag söka the proof myself with Arkivdigital and Google Translate to help me with my rusty svenska. I know I will be back asking for help translating archaic terms. Wow, to think I can trace my family back to the 1600s! I never thought I would see the day. Thank you! As you probably already detected there is an error in the Kristdala parish files. Josef Blomgren's wife Kristina Maria Gabrielsdotter is said to been born 13/8 1840 in Misterhult. There is no child born on that day in Misterhult. However, there is a Kristina Maria daughter of Gabriel Persson and Margareta Persdotter born on 13/9 that year. This is exactly one month off. Birth place is Springaremåla, Misterhult. When they marry she comes from Springaremåla. This must be your lady. Springaremåla has coordinates: N 57.46273, E 16.49014 if you want to look it up on a map. Blomsholm was a place located on Klockaregården in Kristdala. Klockaregården is one of the farms on which a good part of Kristdala town later was built. Thank you, Birger, for your help and research. You're right; I can't find Kristina's birth record. I'm looking at Misterhult CI:5 (1831-1860) Image 236 / page 459 and I don't see her born on 13 Sep 1840 either. Could you clarify? I am looking forward to visiting the Klippan library to see my fars-fars-fars-bror's photos. I sure hope I can find some family photos!